Fig. 1. Acmispon glaber (left) and A. haydonii (right) shown at the same scale here. These plants were growing within 20 feet of each other along S2 just north of Scissors Crossing, and photographed within two minutes of each other with the same illumination angle on 8 April 2015 at 5:45 p.m. The A. glaber plant is 60 cm tall and 85 cm wide (2 feet tall and 2.8 feet wide); the A. haydonii plant is 33 cm x 45 cm (1 foot tall and 1.5 feet wide). Both plants are in full bloom; notice that the flowers of A. glaber are numerous and it is easily seen that the plant is in full bloom, whereas the flowers of A. haydonii look sparse by comparison, making it less obvious that the plant is in full bloom. Click on the pictures for larger versions that are not to the same scale. The two species discussed here were called L. scoparius and Lotus haydonii in the first edition Jepson Manual. Their names were changed to Acmispon glabra and A. haydonii, respectively, in the second edition. A 2-5 mm leaflet is a tiny leaflet, and so is hard to miss compared with typical leaves of A. glaber that are two to three times larger. I've also measured some fruit there, and none of the fruit was ever less than 10 mm. I'm always a bit suspicious about species pairs that have what I call magic dividing lines in a key to separate them, such as the one here where a 10 mm fruit makes a plant A. glaber and a 9 mm fruit makes a plant A. haydonii. The leaflet part of the key has only a small overlap in the leaflet length as well. I get even more suspicious when I've looked at a vouchered location for one species but only seen the other species there. Hence I always wondered if A. haydonii wasn't just a depauperate form of A. glaber. The other possibility is that the species are truly different, but hard to separate, either in real life or just in a key. I've looked in two other locations with vouchers of A. haydonii without finding them. One of them, The Potrero, has four vouchers of A. haydonii! Yet once again, my colleagues and I found tons and tons of A. glabra in the 6.5 miles I hiked there, sans any A. haydonii although I was never exactly at the voucher locations of A. haydonii. The other location was Bisnaga Alta Wash, with a voucher that is in the San Diego County Synoptic Collection, considered the best example of A. haydonii among all the vouchers at the San Diego Natural History Museum Herbarium. 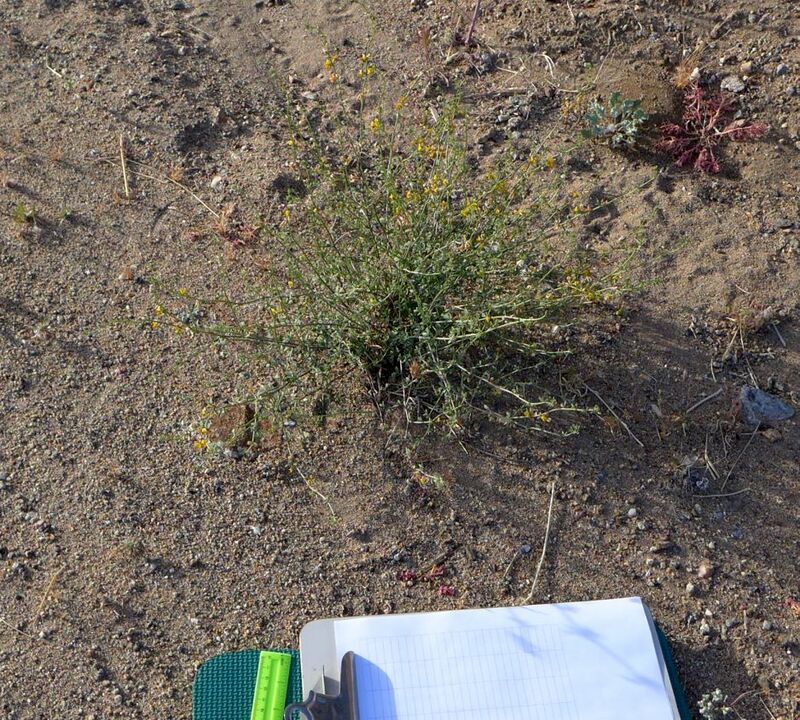 Surprisingly, on 2/9/12 we found no A. haydonii or A. glabra there. But the voucher location wasn't very specific, and we covered only 1/4 of the possible washes it could have been in. Also, there had been a number of dry years since that voucher was taken, and so it might not be surprising that it was no longer there. Hence, after five years without finding A. haydonii in some of its vouchered locations, I had pretty much given up thinking I'd ever see it as of 2012. Two years later, we were botanizing Bighorn Canyon when all of a sudden I realized that all the "A. glaber" plants were small in stature, with small leaves, and fit A. haydonii fairly well! It had dropped into my lap when I least expected it. We botanized the neighboring Nolina Canyon on the next survey, and found more A. haydonii plants, with a bonus of a few plants of A. glaber which appeared quite different. Since then, I've seen A. haydonii in a handful of other locations. They seemed to be reliably different from A. glabra, although I kept finding plants that had somewhat-longer leaves and / or somewhat-longer fruit. This didn't bother me too much, since it is quite common to find measurements outside a range given in a flora due to the small number of voucher specimens actually measured to get the range given in the flora. This is especially true for rare species, like A. haydonii, with fewer voucher specimens to measure. But in March 2015, in each of two locations 37 miles apart, I saw a single plant that had up to five flowers per node, instead of the one to two per node given in the floras and the up to three to four flowers per node I've seen previously on a few plants, amidst a number of plants with fewer flowers per node. This caused me to wonder how good the Jepson Manual description for A. haydonii was, and how well it was discriminated from A. glabra. 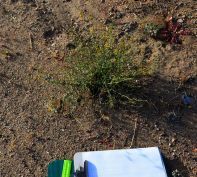 Hence on 8 April 2015, I began measuring some plants to see what the range of characteristics actually was, and how well the two species were discriminated. This is a work in progress. I intend to measure plants from the type locality for A. haydonii, Mountain Springs, soon to add to the analysis. Hence any conclusions from the following analysis should be taken only tentatively. 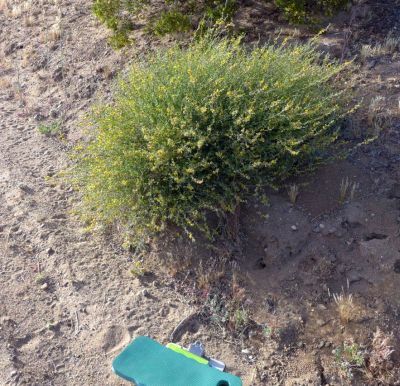 On 8 April 2015, I measured two plants on the PCT north of SR78 / Scissors Crossing, including the one plant I had noticed previously that had up to five flowers per node. The other plant I measured was the next one encountered on the trail, a few hundred feet farther. I then measured the first set of plants I saw while driving on S2 north of Scissors Crossing, which were about one mile to the north of Scissors Crossing, shown in Fig. 1. By luck, one was a much larger plant and appeared to be A. glabra. The other one had the short stature of A. haydonii, but it had fruit up to 16 mm long, way beyond the maximum length of 9 mm that A. haydonii was supposed to have. Hence in the field I thought this plant was A. glaber, but the analysis presented below clearly said this plant was A. haydonii. The measurements for these four plants are given in Table 1, along with the measurements for a clear A. glaber plant in my yard in Fallbrook, north San Diego County. The last set of measurements in the Table came from selecting one stem on each plant, and recording the numbers of flowers or fruit at each node, beginning at the lowest node and continuing until I ran out of stem, or ran into the developing portion of the stem where I couldn't easily count the buds. The median number of flowers / fruit on that stem is reported in the row just above the counts of the number of flowers / fruit at each node. I first did a Principal Component Analysis (PCA) using all the measurements, which showed a clear separation between the two species, and revealed that my field assignment of the plant at GPS #17 to A. glaber, from the very long fruit length of 16 mm, was incorrect, and that plant was clearly A. haydonii. Plots of the PCA are given below. Then on looking at the characteristics responsible for the differences seen in the PCA, it became clear that a PCA was not actually needed; the separation was clear in a number of characteristics. The next set of plots show some of the characteristics with clear differences between the species. The most obvious difference is the size of the plants, shown in Fig. 2. Fig. 2. Plot of plant width versus height. The hairs on the stem, leaves and calyx are different. These plants of A. haydonii are strigose; the plant of A. glaber on S2 is thinly strigose, and the plant of A. glaber from Fallbrook is glabrous to thinly strigose. Fig. 3 shows the variation, assigning a value of 1 for the hairs if the hairs are strigose; a value of 0.5 if the hairs are thinly strigose; and a value of 0.0 if there are no hairs. Fig. 3. Plot of calyx hairiness vs. stem hairiness. Because all plants of A. haydonii have values of 1.0, the data points were dithered to show the three specimens in the plot. The size of the leaves are different as well. Fig. 4 plots the width vs. length for the largest leaf I could find on each plant. Fig. 4. Plot of leaf width vs. length for the largest leaf I could find on each plant. These plants do not show the difference given in the floras for the number of flowers per node, nor for the longest fruit length on the plant. Fig. 5 shows that contrary to the Jepson Manual key, the largest fruit was found for plants corresponding to A. haydonii, not to A. glaber. Although there is a tendency for the number of flowers per node to be smaller for A. haydonii, only two of the plants have the advertised one to two flowers per node, with the third plant having a median of three flowers per node. However, note that this is a selection effect for the plot, since I intentionally selected that unusual plant to measure in this set. Such large values are almost surely outliers. Fig. 5. Plot of the median number of flowers per node for one stem for each plant vs. the maximum fruit length I could find on each plant. The PCA using all the data cleanly separated the two species for the primary component, PC1, shown in Fig. 6. Species separations don't get much better than this, with the two species at the extreme values for PC1. Many characteristics contribute to the separation in PC1. The large difference in the value of PC2 for one specimen of A. haydonii comes primarily from the very long fruit on that plant. Fig. 6. Plot of the first two principal components, PC2 vs. PC1, using all the data. The red lines indicate which of the characteristics contribute the most to PC1 and PC2, which is discussed in the text. I was interested in how well the species would separate without using the plant size and the hairs, so I did another PCA without those characteristics. Fig. 7 shows another PCA in which those characteristics were discarded. There is still excellent separation between the species, with all characteristics contributing to PCA except for the fruit length and calyx lobe length. Fig. 7. Plot of the first two principal components, PC2 vs. PC1, using all the data except for the size of the plants and the hairs on the stem, leaves and calyx.